Accurate Engineering & Manufacturing has been in business since 1995. The Holland, Michigan-based metal fab job shop serving clientele primarily in western Michigan, producing anywhere from one piece to 2,000 pieces, with most runs in the sub-ten piece range. Accurate has carved out a niche for themselves in short run, high precision work. They’ll reverse engineer parts for their clients, and they don’t shy away from challenging projects or materials. Investing in new technology keeps Accurate at the head of the pack. After shifting to SOLIDWORKS a few years ago, they purchased a laser cutting machine to boost productivity and accuracy over their hi-def plasma. The laser led to more precision jobs, and Accurate quickly found itself in need of a more precise press brake that could keep pace. They turned to Cincinnati, and have since seen increases in not just accuracy, but efficiency as well. Accurate didn’t do much shopping at FABTECH 2016 in Chicago, but they did stop by the CI booth at the show. 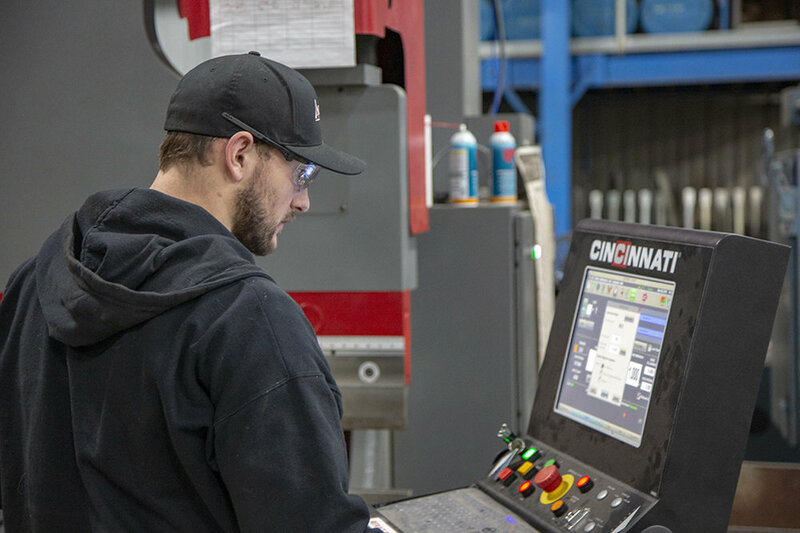 When they did, Randy VanderPloeg (Owner & President) and Chad Hill (Shop Manager) were instantly impressed with our press brake lineup, Bend Simulation software (more commonly known as Bend Sim), Cincinnati service and support in nearby Hudsonville, Michigan and, above all, the fact that CI machines are USA-made. The brake Accurate chose was a 175-ton BASEFORM with Bend Sim. It was ordered in October 2017 and on the floor that December. The new machine complements the existing laser and process at Accurate. Parts are designed in SOLIDWORKS and the Bend Sim software streamlines the production floor process. If, like Accurate, you’re in the market for a total game changer, we can help. Click the PRODUCTS tab of our website to see the range of fabrication at CI, and contact us when you’re ready.